At two Publix supermarkets in Parkland, survivors of the February shooting at Marjory Stoneman Douglas High School shouted “USA, not NRA!” as customers navigated their shopping carts around them on the floor, according to the Associated Press. Counterprotesters supporting the NRA turned up at one of the stores, where a near-confrontation almost occurred between two men before police intervened. Well, if that were the standard, I would say that first of all, no one cares, kids. No one. People go to grocery stores to buy food, feed their families, and get on with their day. Only the most hipster of Americans actually cares about this type of commercial activism, and they usually do it while wearing clothes made from sweat shops. Second, like Minnesota Vikings fans, these kids are bound for disappointment. No, that’s no quite right. It’ll be absolute devastation because they’ve already lost. I have a news bulletin. The NRA has experience record fundraising this year. In fact, the NRA’s Political Victory Fund raised more than the top three anti-gun PACS combined last month. April had another record month in gun sales, though some of the background checks ran during that period could have been for concealed carry permits. Still, all of this activity is in support of the Second Amendment and gun ownership. The NRA also had a goal of increasing membership by 100,000. Well, they soared past that by 900,000. The NRA, which touts its five million members, of which I have been a proud one since becoming eligible to vote, is now a six million strong organization. So, it would seem that a lot of people support the NRA, its message, its principles, and its agenda. But wait—isn’t support for gun control high? Right now, yes—but as always, it dips precipitously as time goes on. It happened with Sandy Hook. It’s happening now. There’s a reason why new gun control laws are only passed in the most liberal areas of the country, it’s because it’s not popular. Yes, two GOP governors, Rick Scott and Phil Scott of Florida and Vermont respectively have passed anti-gun laws. They betrayed Second Amendment principles. If betrayal is the only way to get red state governors and lawmakers to bolt from the NRA, I’m not worried. Not many would go down this road Rick and Phil took on this issue. 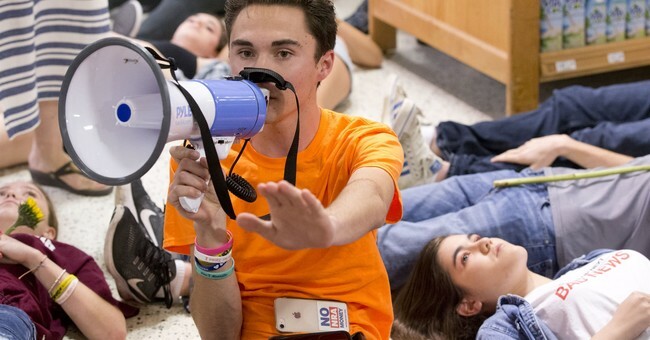 March for our Lives and their appropriated Holocaust remembrance slogan will vanish into the ether soon because in the end, there is nothing that’s going to change our defense of our constitutional rights.